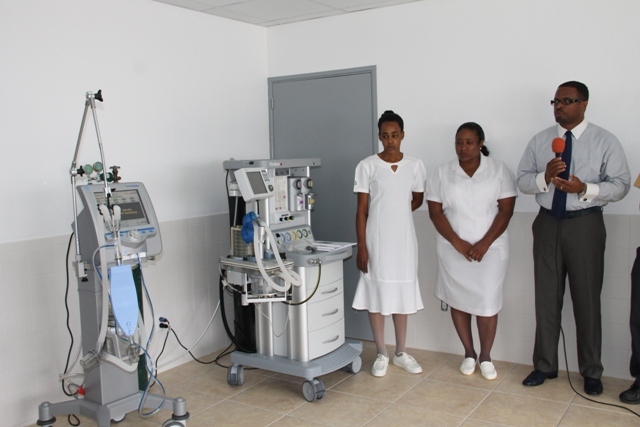 NIA CHARLESTOWN NEVIS (November 26, 2014) — The public on Nevis will benefit from the installation of two pieces of state-of-the-art equipment for use in the delivery of critical care services at the Alexandra Hospital. 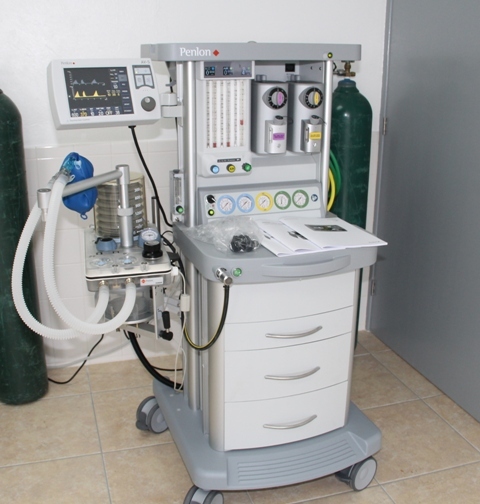 The digitalised and touch screen Ventilator and Anaesthesia machines were commissioned by Deputy Premier of Nevis and Minister of Health Hon. Mark Brantley, at a brief ceremony at the Hospital on November 26, 2014. In remarks, Mr. Brantley renewed the Nevis Island Administration’s (NIA) commitment to the health care and health care sector on Nevis. 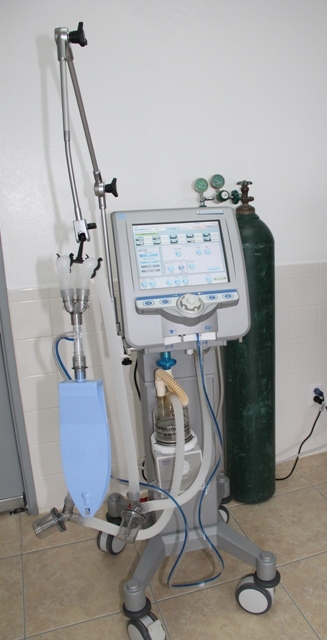 He described the US$50,000-equipment as a significant investment in the health care delivery services on the island. 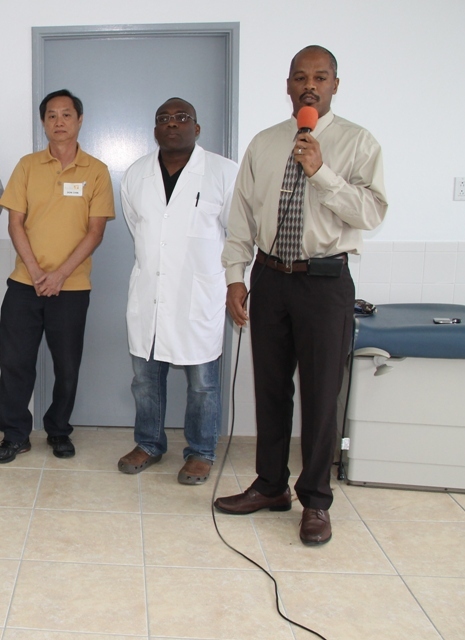 The Minister pledged continued commitment to health care delivery on Nevis. “Here we continue to do the best we can to provide quality health care to the people of Nevis and the public has my pledge, that so long as I am here, that we as a government will continue to provide the necessary tools and equipment, so that our doctors and our professional people can provide the public with that quality of healthcare. “I think today is a momentous occasion and we are really happy. It may seem simple but it is significant in terms of the delivery of quality health care to our people,” he said. According to the Mr. Brantley, the ventilator would be used in the Intensive Care Unit (ICU) and would replace an ageing ventilator there. He noted that there had been two additional ventilators in use at Surgical Unit of the Hospital. He stated that apart from the new equipment he hoped to return to the Hospital soon with more good news about the improvements at the Alexandra Hospital. The Health Minister explained that health care delivery at the Hospital continued to improve gradually and the newly commissioned equipment would help. “We continue to strive, sometimes against difficult odds but nonetheless, continue to, one step at a time to improve what we have and I believe now that these two pieces of equipment will help and help tremendously in the delivery of critical care services to the people of Nevis,” he said. Mr. Brantley registered his gratitude to all those who continue to assist with the development of the health care delivery on the island. “I am very grateful to my colleagues in Cabinet and the entire Nevis Island Administration who have really put their weight behind the health care system here and to all the staff here – the Chief of Staff, the Hospital Administrator and the nurses – who stand here with us to demonstrate that Government and the technical people here at the Hospital, continue to work hand in glove to try and improve the standard of care and the quality of care that we provide to the people of Nevis,” he said. Mr. Brantley also thanked Andar International – Miami the makers and distributors of the machines. “I can’t say enough about Andar and all they have done and Mr. Chin for coming here and dealing with the training. We actually have had this bit of equipment for some time but we had to wait until Mr. Chin was available to come in because we understood that was part of the package to install and to train and so we are very grateful that he has been able to make it and that this equipment now will be available,” he said. Meantime, Medical Chief of Staff at the Alexandra Hospital Dr. John Essien welcome the new machines, which he explained were essential in the delivery of critical care at the health facility. “We have a ventilator, an artificial ventilation unit, which would be used in our ICU and of course the anaesthesia machine which also has similar functions would be used in the operating room. “Both of these machines are extremely essential in maintaining a person alive under certain critical circumstances and we are more than pleased to have them in our arsenal, in terms of our care for patients,” he said. Remarks were also made by Hospital Administrator Gary Pemberton who chaired the ceremony and Andar’s technician Mr. Don Chin. During Chin’s two-day visit, he installed the equipment and conducted training sessions with the nursing staff on how to use the new machines. Present at the ceremony were Nurse Manager Jessica Scarborough, who stood in for Matron Aldris Dias and Critical Care Nurse Sylvannie Andre.